Here Are Our Picks of 20 Influencers from 7 Countries Across the Continent of Asia Who Are Killing It in the Health, Beauty, Fashion, and Parenting Spaces. KILLING IT!! We love helping you guys find new influencers that you haven’t crossed paths with before. We’ve already created some pretty cool roundups of influencers from Canada, Africa, Australia, as well as our faves in parenting, photography, makeup, and a whole host of crazy-cool Gen Zers. This time, we’re flying half-way around the world to the vast and varying continent of Asia. From South Korea to India, Malaysia to Vietnam, we’re taking a look at the influencers who are killing it over there right now across beauty, fashion, parenting, and fitness. We had a really hard time narrowing down our selection for this article. But, somehow we managed to pull together our influencer picks across these niches for you to discover and follow! Full of energy and smiles, Michelle Dy is a healthy living beauty vlogger and influencer who slays with her makeup looks every damn time. She has over 1.3 million subscribers on her YouTube channel and 772k followers on Instagram. Her adorable and quirky style keeps you watching, even if you don’t understand her (she creates videos in English and Tagalog). A beauty and lifestyle blogger based in Singapore, Celine Chiam has a beautifully-curated Instagram feed featuring everything from travel reviews, to beauty tips, to her favorite outfits. Oh, and that smile. With more than 851k subscribers on YouTube and 401k followers on Instagram, Mintchyy is one beauty influencer who has found her space on Instagram. Her Insta feed is comfortably “real life” with snapshots of Miintchyy snuggling with a pup or playing in the snow. That over-posed, for-Instagram vibe you get with a lot of the more well-known influencers is noticeably absent. She seems accessible… which is part of her charm. Kiara Leswara is an Indonesian beauty influencer who is serving up some stunning makeup looks throughout her Insta feed, and giving us some serious skin envy! She’s already partnered up with top brands like Pantene to help promote their products, and is a true rising star in her niche. Chloe Nguyen’s feed is bursting with stylish shots of her spot-on beauty and makeup tips as well as a healthy serving or picturesque travel snaps. Nguyen’s effortless style and expressive face make for a stand-out feed that puts her at the top of the beauty pile. Being a mom doesn’t stop you from being fabulous and fashion forward, according to Heominhon, a parenting influencer from Vietnam. Her Instagram feed is styled with muted colors, family snaps, and stylish home decor that we would kill for! One of the smaller micro-influencers in this post, Timothy Tiah is a Father that has captured our attention for his family-focused feed and adorable family. And, it would seem that social media runs in the family, as his wife is an influencer in her own right over at @fourfeetnine. Mikaela Lagdameo Martinez is a powerhouse of social influence and has already worked with brands like Ford and Cetaphil. A mother to three adorable children, and with a style that’s hard to match, she is definitely one to watch. Killer photography, a beautiful family, and a set of dedicated followers - it doesn’t get much better than this when it comes to influencers on Instagram. Fifi alvianto fills every shot with joy, laughter, and style, and we can’t stop diving into her feed when we need a little pick me up! A super-chic mom and an amazingly adorable little girl make this account too good not to follow. Tukta Panida’s Instagram feed is packed full of color, fun, and general adorableness as her little girl dresses up as a mermaid, or digs into giant desserts. From ballgowns to bathrobes, Aayushi Bangur Sahu knows how to work an outfit! This style influencer has filled her feed with a range of looks that would give anyone some serious wardrobe envy (including us!). I’m pretty sure that Brian See has more style in his pinky finger than many of us have in our entire bodies! Every shot on his feed is perfectly put together in a way that looks naturally effortless. We are 100% obsessed with this guy here at The Shelf, and you should be too! Another feed that you’ll find us pouring over for hours is that of Eunice Annabel Lim. Her young, fresh sense of style and ability to make fun of herself (scroll down for pictures of her covered in burgers and fries!) make her a breath of fresh air on an otherwise overstyled platform. Helly Tong is a model and fashion lover whose feed simply oozes arty coolness. Every shot is practically an individual work of art. While she leaves us feeling way less cool than we already do, we just can’t give her up! Blogger, vlogger, and social media superstar Anastasia Siantar is doing it all! With over 380k followers on Instagram, and 11k subscribers on YouTube, Siantar’s audience is growing day by day. And, she’s already working with top brands like Qantas, so expect to see much more from her in the future! With fitness inspiration and abs for days, it’s no surprise that the blogger known simple as @Forcejun has nearly a quarter of a million loyal followers. His cheerful attitude is an awesome motivator for those looking to follow in his footsteps and whip themselves into shape! With YouTube channels in both English and Hindi, Ranveer Allabadia is helping people across the globe improve their lives both in and out of the gym. His sunny disposition, positive vibes, and fitness expertise make this an essential account to follow for those looking to do a little self-improvement. A professional beach volleyball player and fitness enthusiast, Bea is one of the best fitspiration accounts out there right now. She even uploads mini workouts you can try at home to get yourself a body as amazing as hers (or at least try!). 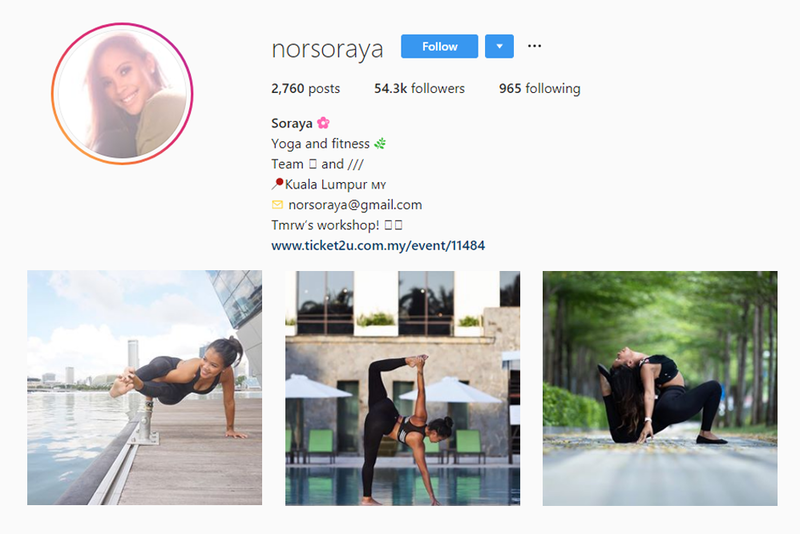 Another awe-inspiring yogi to follow, Soraya’s feed is filled with insanely flexible poses, and fitspiration for all. And forget about boring backdrops, most of her amazing poses are set against stunning scenery to give them a truly beautiful style. Of course, this is just a small selection of some of Asia’s top influencers, there are thousands more out there that we just couldn’t squeeze into this post. Who are your favorites? Tell us in the comments!